In other words a trio of poor, innocent US peace boats came under a vicious surprise attack as they were peacefully minding their own business on a peace mission spreading peace and love in the Red Sea, and were forced against their will into fighting back…or something like that. To be clear, this incident is by no means the first example of US involvement in the conflict between Saudi Arabia and the Houthi rebels in Yemen. Recently revealed documents show that the US government’s own lawyers worried that a $1.3 billion arms sale to the Saudis last year would make the US co-belligerents in the war and thus legally responsible for Saudi war crimes in the bloody conflict. In fact, rumors of much deeper American involvement in the war, far beyond the mere logistical support they have supposedly been giving the Saudi Air Force, have been floating around the independent media since the conflict began. But to actually begin firing on Houthi targets in Yemen with US weapons from US boats represents a worrying escalation. 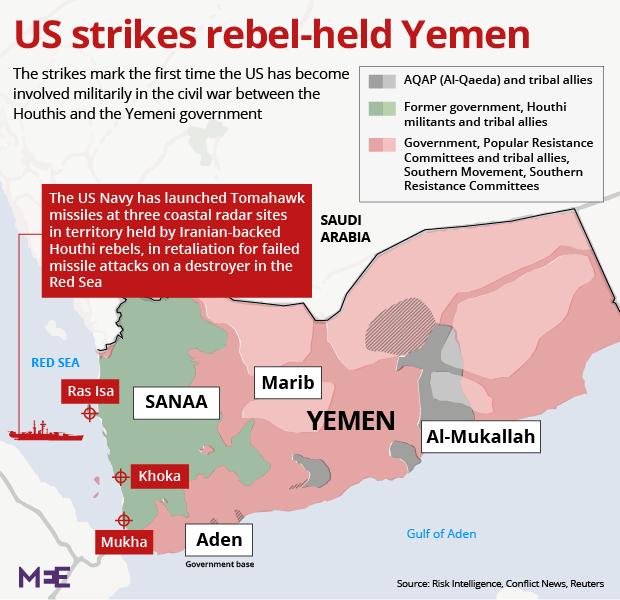 With the whole region on edge, another incident risks propelling the US into yet another bloody sectarian war in yet another dangerously unstable Middle Eastern nation. Into this volatile mix came worrying news: the USS Mason had been attacked again on October 15th! “You might consider it strange that the Houthis, who have not fired on American ships ever before in the nearly 2 years of warfare in Yemen, suddenly decided – just as American support for Saudi Arabia was in question – to launch missiles at an American destroyer. Yes, it certainly would be strange if the Houthis suddenly began an all-out assault on the world’s military superpower two years into a heated conflict with their neighbor. That is to say, it would be strange if that attack had actually happened. Which it didn’t. Of course. Notice the words “believed to be” in that last sentence? The Pentagon hopes you didn’t, because, as it turns out, they’re not so sure now. As USNI News reported last week, the Pentagon is “still unsure” if the Mason was actually attacked at all on the 15th. “We actually have not confirmed that happened and we’re going back and looking at all the information to see what might or might not have happened and that’s where we are,” said Pentagon spokesman, Navy Capt. Jeff Davis. So the sudden increase in attention on Yemen and the sudden increased US support for the Saudis’ devastating, war-crime laden war there is down to an incident that didn’t even happen. Again. Does this sound familiar? It should. This is exactly how the United States became (officially) embroiled in the Vietnam war. The official story: In August 1964 the USS Maddox, peacefully minding its own peace business in the peaceful Gulf of Tonkin came under vicious surprise attack from North Vietnamese torpedo boats. The first incident occurred on August 2nd. Then just two days later it was attacked again by the perfidious Charlies. President Johnson had no choice but to solemnly commit the United States to war, launching retaliatory strikes and ramming the Gulf of Tonkin resolution through congress, thus formally launching the Vietnam War. Of course, it was later revealed that the official story had been (you guessed it!) a tissue of lies. The Maddox was not peacefully drifting near Vietnamese waters, minding its own business; it was part of a covert naval squadron launching attacks on the North Vietnamese. On August 2nd, it had fired a volley of shots when the Vietnamese approached, a fact omitted from the official report (which maintained that Charlie fired first). And the August 4th attack? It never happened at all. That’s not conjecture, that’s the official conclusion of the NSA’s own internal publication, made available to the public for the first time 40 years after the non-incident itself. Now the story of the Gulf of Tonkin (or this month’s altercation in the Red Sea) will not be surprising to those immersed in the history of America’s naval engagements. Sadly, history is replete with framed up, ginned up, or just plain made up naval incidents to get the US public behind war. In 1898 the US drummed up support for the Spanish-American War by pretending that the USS Maine had been blown up by the dastardly Spaniards while it was peacefully minding its own business in Havana Harbor. William Randolph Hearst, the subject of Citizen Kane‘s satircal gaze and the father of yellow journalism, contributed to the cause by fabricating hysteria over the incident (“Remember the Maine and To Hell With Spain!”). The McKinley Administration set up a naval board to “study” the incident, and to the surprise of absolutely no one concluded that the Maine explosion was the result of an external mine. In reality it was almost certainly a coal bunker fire that caused the ship’s magazines to ignite, but the warmongers got what they wanted: the Spanish-American war and the advent of the American empire. 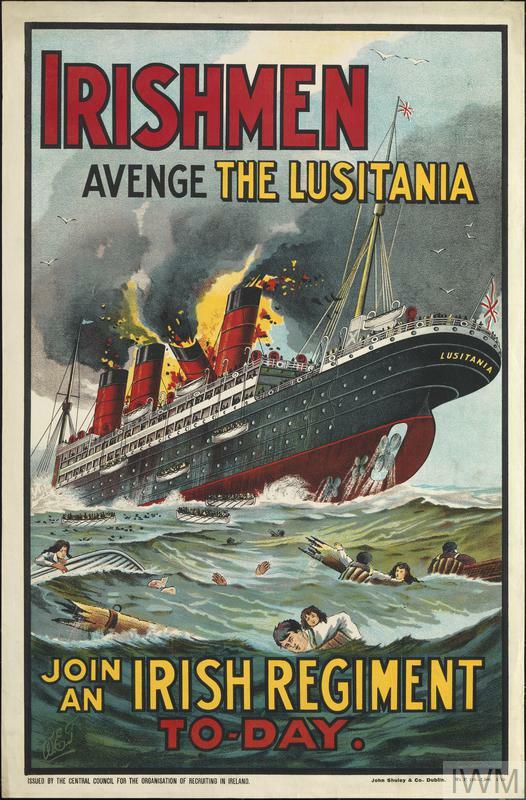 In 1915 the RMS Lusitania, a British ocean liner en route from New York to Liverpool, was sunk by a German U-boat 11 miles off the coast of Ireland. The ship’s sinking, which resulted in the death of 128 of the 139 Americans aboard, became a symbol of German evil and helped prepare the US public for eventual entry into WWI. Once again, every facet of the story as presented to the public was a deliberate lie or a lie by omission. The boat was not a purely civilian vessel carrying 3,813 40-pound (unrefigerated) containers of “cheese” and 696 containers of “butter,” as the official manifest held, but guncotton, in keeping with the shipment’s stated destination: the Royal Navy’s Weapons Testing Establishment. It was not sunk by the German torpedo boat but secondary explosions from the munitions the ship was (illegally) carrying. It was not the victim of a cowardly German surprise attack (the German Embassy placed a warning notice about the Lusitania in 50 American newspapers right next to Cunard’s own listings). And the American ambassador to England at the time, Walter Hines Page, wrote to his son five days before the ship was sunk, asking: “If a British liner full of American passengers be blown up, what will Uncle Sam do? That’s what’s going to happen.” So what did the official cover up conclude? That the dastardly Germans had waged a perfidious sneak attack on an innocent peace boat, of course. The Pearl Harbor attack, too, was a deliberate attack by an enemy power, but just like the sinking of the Lusitania the American public knows almost nothing about the real story of that attack. It isn’t just that the Roosevelt administration deliberately and methodically provoked Japan into an attack (which they documentably did), they actively aided the Japanese in that attack. In 1940 Roosevelt personally ordered the Pacific Fleet to relocate to Pearl Harbor over the angry objections of U.S. Fleet Commander Admiral J. O. Richardson. Richardson warned that the fleet would be sitting ducks at that location and vulnerable from 360 degrees to a Japanese attack, but Roosevelt overruled him and, four months later, relieved him of his command. We now know there were multiple methods by which the US knew of the attack in advance and that various officials in the chain of command deliberately stood down and allowed the attack to proceed. And on December 7, 1941, after yet another chance to expose the plot and warn Pearl Harbor was sabotaged by Chief of Staff General Marshall, Roosevelt had his “day of infamy” and the US was embroiled in WWII. “Presuming that you are not actually ignorant enough to desire war with the United States, you might be well advised to read the history of the sinking of the U.S.S. Maine in Havana harbor in 1898 and the history of the Gulf of Tonkin in 1964. Senator Hart may be many things, but he is not a stupid man. He knew exactly what message he was sending by referring to the Maine and the Gulf of Tonkin as examples of how the US is drawn into war. His subtext is clear: do as we say or we will blow something up in the Persian Gulf and blame it on you. Do you think that was an idle threat? It absolutely wasn’t. We now know that just months after Hart’s letter was published, in the wake of a January 2008 incident in the Strait of Hormuz between Iranian speedboats and US warships, then-Vice President Cheney convened a meeting with high-ranking naval officials with one specific question in mind: how to create a casus belli between Tehran and Washington. One suggestion they kicked around at that meeting: building fake Iranian PT boats, manning them with armed Navy seals, and deliberately attacking a US ship in order to start an international incident. If Cheney’s 2008 meeting had come to the conclusion that a naval false flag was the best way to kick start the war with Iran that the neocon hawks had been lusting after since the fall of Saddam, then it is debatable whether we’d even still be here to talk about that decision. Now think about any number of flashpoints around the world, from the South China Sea to the Red Sea, and how a naval false flag could draw the US (and the world) into all-out war. It’s as simple as problem, reaction, solution. James Corbett started The Corbett Report website in 2007 as an outlet for independent critical analysis of politics, society, history, and economics. It is an independent, listener-supported alternative news source. It operates on the principle of open source intelligence and provides podcasts, interviews, articles and videos about breaking news and important issues from 9/11 Truth and false flag terror to the Big Brother police state, eugenics, geopolitics, the central banking fraud and more. James produces video reports for GRTV, and BoilingFrogsPost.com. He is also an editorial writer for The International Forecaster, the weekly e-newsletter created by the late Bob Chapman. Agree with you James, complete psychopaths these idiots that run the world?